See how our customers benefit from some of CentralOffice's state-of-the-art-features, while paying less for their communication solution. Xchange CentralOffice brings you an enterprise level phone system at significantly lower monthly service fees compared to the traditional phone system in your office. Included in the monthly plans are both the phone system features as well as unlimited calling plans. 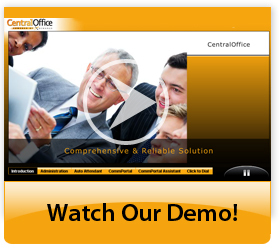 CentralOffice gives you the flexibility to move your system to any location in the world. Simply plug the CentralOffice phones into any Internet connection and your calls will automatically ring on your desk. Anywhere. Is your company hiring? With Xchange CentralOffice adding phones for new employees is a breeze! Just plug in a phone and the employee is ready to make and receive calls. No more need for expensive service calls. Need some changes made to your phone system? With CentralOffice you will reduce fees associated with Moves, Adds or Changes. By using our online administrator web portal or by giving Xchange a quick call you can accomplish your goal with little or no cost to you. Ext to Ext Dialing - Simultaneous Ring - Call Log - Visual Voice Mail - Fax to eMail - Call Routing Manager - Auto Attendant - Click to Dial, plus much more.